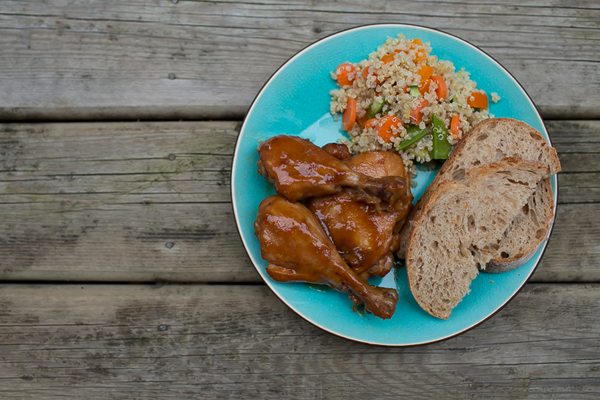 I prefer bone-in pieces like drumsticks and thighs as I find them to be more moist and flavourful than boneless breasts. I usually remove the skin, but that’s a matter of personal preference. To easily remove skin from a drumstick, grasp the skin in a piece of paper towel and pull. This eliminates it slipping out of your hands! Or alternatively, ask one of our friendly butchers to do it for you! Mix all sauce ingredients together in a bowl. Marinate the chicken in this mixture overnight, or bake right away. If marinating overnight, cover the chicken with the marinade in a bowl, or put in a large resealable bag, and refrigerate. When ready to bake, proceed. Place chicken pieces in a large enough pan to hold in a single layer and pour sauce over. Cover with foil, and bake in a 350 degree oven for 1 1/2 hours or until chicken is nicely browned and tender. Baste occasionally. Remove the foil for the last 15 minutes to brown the chicken. The honey might cause it to brown quite quickly, so watch it carefully to ensure it doesn’t burn. If serving with rice or egg noodles, and you like lots of sauce, you can easily double the sauce, just remember to double the cornstarch as well! We ♥ Local BC celebrates BC agriculture, raises awareness of BC's food system and connects you with local farmers and ranchers. © 2018 We Heart Local BC. All Rights Reserved.